There are 4 places dedicated to editing content sections. Click on the grey cog icon next to the Page Content section and enable/disable boxed content. Boxed content serves to a better arrangement of the content sections within the webpage. For every page section you want to edit, click on the green cog icon next to it, to expand the panel with customization option. 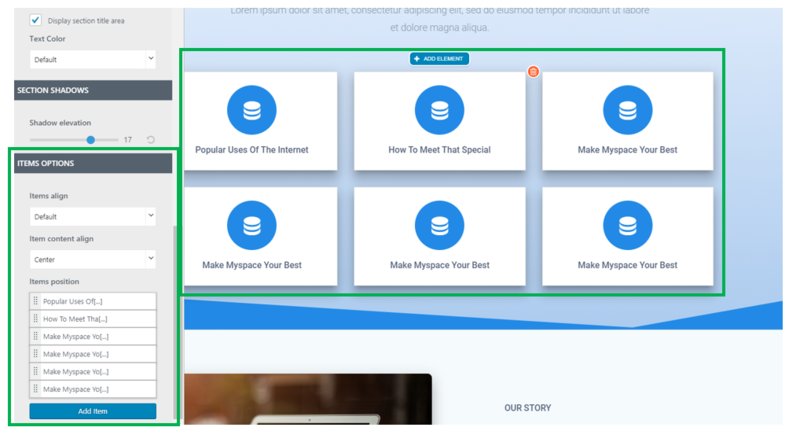 Set the distance of the content in the section, as related to the top (Hero or previous content section) and to the bottom (next content section or footer). The values are expressed in pixels, for a better assessment of the section dimensions. Background Overlay – apply a semi-transparent color to the background of the content section, to obtain a nice visual effect. Choose the nuance that fits your design preferences. Section separators are graphic elements delimiting the section from the top of the page, and from the next sections/footer. Text color (here, the options include default, white text – you should place it on a darker background, and black text – you should place it on a lighter background). You can apply some shadow to the section elements. By choosing certain values on the slider, the shadow will be accentuated or faded. To edit content in the live preview, you need to click on the pencil icon inside the element you want to edit and start customizing.